Happy Halloween everyone! Did y’all have a great time on Saturday? I had a low key night this year and it was perfect! I wanted to greet trick-or-treaters at the house, so I invited a few friends over and we ate lots of yummy food and greeted all the kids who came to the door! 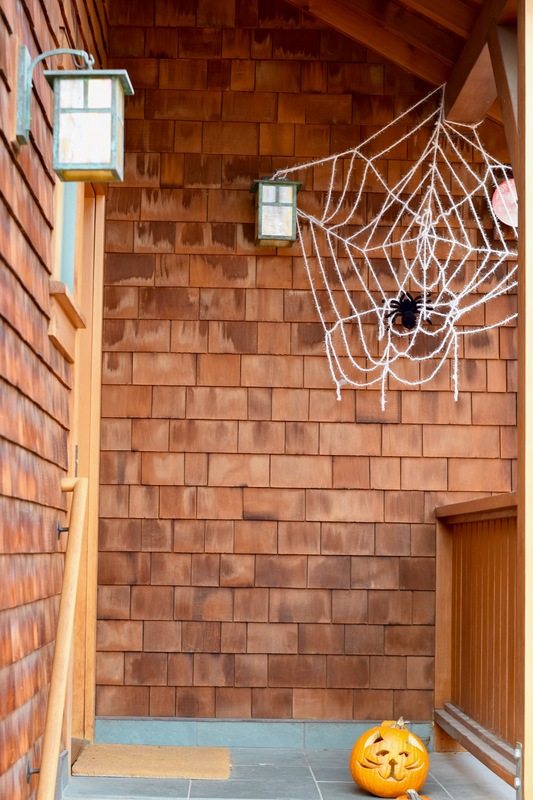 I thought I’d share a quick post today about how I decorated the exterior of the house and how I solved the quintessential Halloween house problem! Like many, my home sits at the end of a long, dark driveway. In fact, unless you knew my house was there, you would hardly notice it! Our driveway is well lit, but the lights are all motion activated, so it stays dark unless you walk on down. 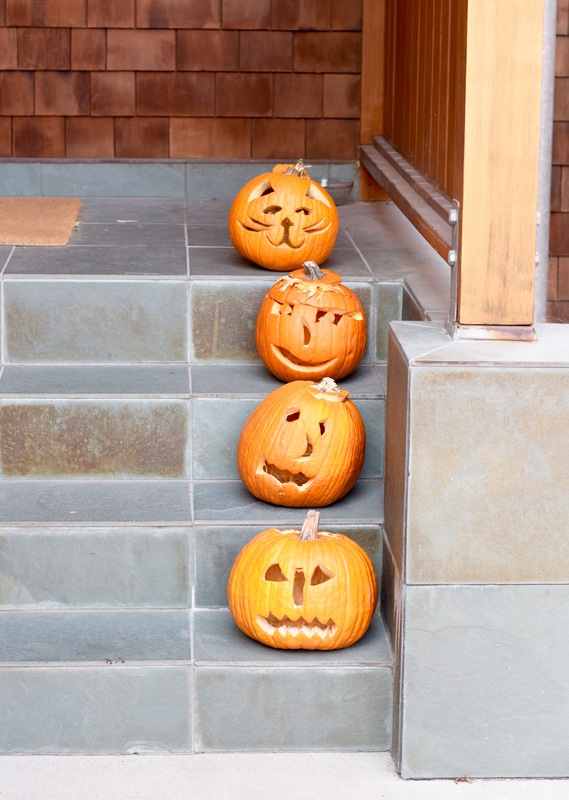 This year, I wanted trick-or-treaters! LOTS of trick-or-treaters! I was super excited about this an determined to make it happen! I came up with the idea to solve the dark-long-driveway problem and encourage trick-or-treaters to give us a ring! Because, honestly, this works out in both our favors: I get to see all of the awesome costumes and the kids get a handful of the good stuff. None of the “eh” candy at this house! No way! I stocked up on Reese’s and KitKat bars. That delicious, chocolately, overly processed junk that is addicting in the very best way. Plus, if I didn’t get many trick-or-treaters, I’d end up eating all the leftover candy, so I needed to make this happen! 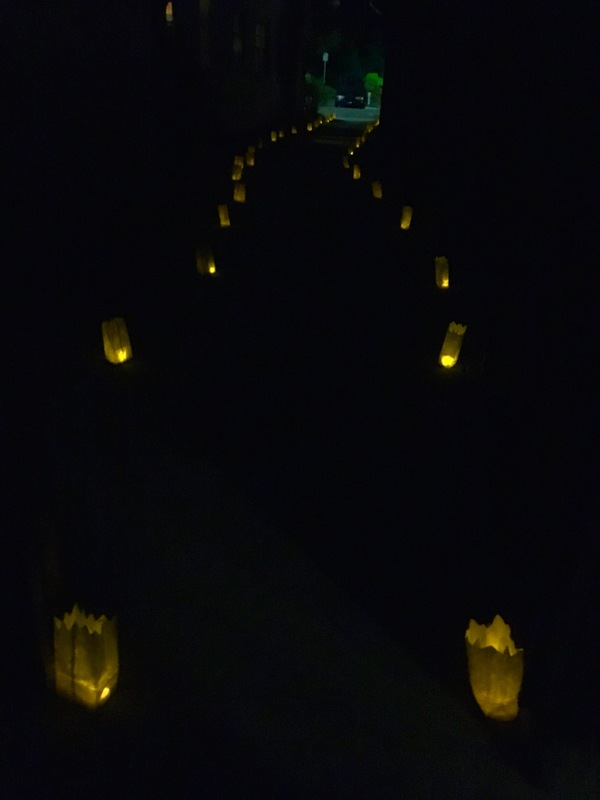 I don’t know what inspired me, but one day at work, I suddenly came up with the ultimate idea: lining the driveway with lights! But how to do this? Lights inside paper bags would put off a softer glow. But, candles are a fire hazard and definitely a no-no in drought-stricken California. What about LED fake tea lights? That is a yes, my friends! Before I could talk myself out of this idea, I hopped onto Amazon and bought these beauties! They are perfect! The amber color really does look like a flame and they flicker just like a real candle would!! I grabbed a ton of paper lunch bags from Smart & Final, cut a jagged top, and filled the bottoms with a small handful of gravel. I placed the bags all along the driveway and then, at dusk, stuck a tea light or two in each bag. They lined the driveway creating a little runway that screamed, “Hey you! Hey, over here! Come down this driveway and get some Halloween candy!” It was perfect! Many of the parents walking with their kids complemented me on the “runway.” It put our hidden-away house right on the map! In this photo the lights look a bit yellow, but in real life they were much more orange-y amber. It was gorgeous! Other than the “runway” my decorations for Halloween were limited, I threw up a spiderweb with a big ol’ spider and carved pumpkins with my roommates! …and they looked ever cooler at night! That last photo was taken with my iPhone, so don’t judge it too harshly! The pumpkins looked awesome though! I take so much pleasure in these little things. Carve a pumpkin, stick a tea light in it and I’m in heaven! 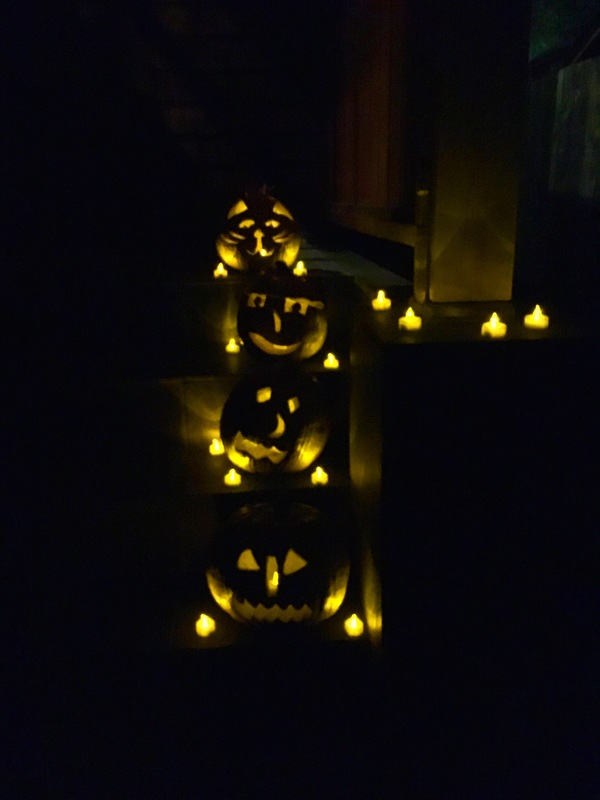 I used the same LED tea lights in these pumpkins and then placed a few more around them as well to create more of an atmosphere! The tea lights were realistic enough that a few cautionary mothers warned their kids to be careful and not touch them! It was pretty adorable! How was your Halloween? Did you go all out? Did you dress up? I went as superman at work on Friday, switched it up and went to a party as a little German boy in Lederhosen that night, but by Saturday, I was so busy cooking, I totally forgot to put on my sugar scull face paint! Oh, well! There’s always next year!